We drive by car in the direction for the day while the guide. When we stop the guide tells about the area and help you get acquainted with the camera and practice some photographing in order to be well prepared to take good pictures of landscape, animals and plants during the tour. When we feel confident with the camera we go in search of photo objects. We choose our objects depending on interest, the weather and the sami eight seasons, while our guide tells about the area, the nature and about the sami life. 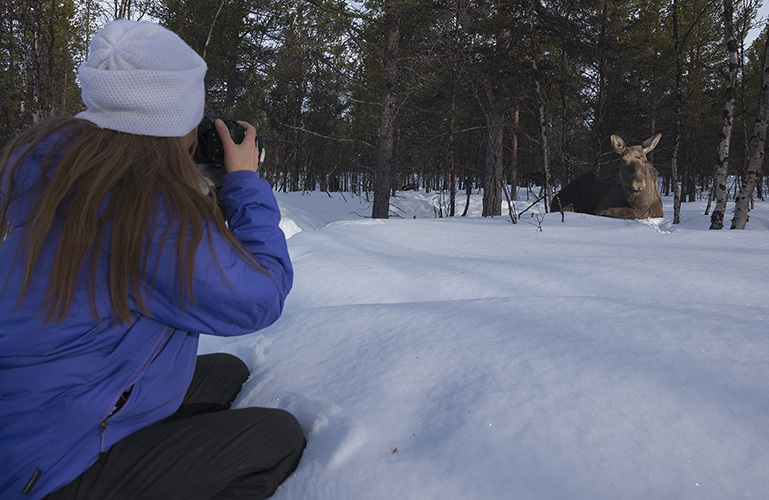 We can never guarantee you pictures of for example wild animals, but we will search for good nature sceneries, sneak up on arctic animals and photograph plants. The tour ends with a cup of coffee or tea and a cake. We use a minibus for transport but as we will also be walking in the forest we recommend that you wear good clothes for the season, mittens and a warm hat on the tour.